1. The flower arises from a large dormant corm (a bulb-like structure) during the winter months here in Michigan. This species is native to east and Southeast Asia. Interestingly enough, the corm is used to make flour and jelly and as a vegetarian substitute for gelatin in many Asian countries. 2. The flower gives off an odor for 3-5 days that reminds one of rotting flesh. This is to attract pollinators such as flies and beetles that frequent dead animal carcasses. The odor is most intense on sunny days. 3. The scent is created by the chemical breakdown of organic chemicals with names such as putrescine and cadaverine as well as floral chemicals. This scent can actually make one feel nauseous when close to the flower. 4. This plant belongs to the same plant family as the skunk cabbage (Symplocarpus foetidus) and Jack-in-the-pulpit (Arisaema triphyllum), two plants native to North America that also have a spathe/spadix flower structure. 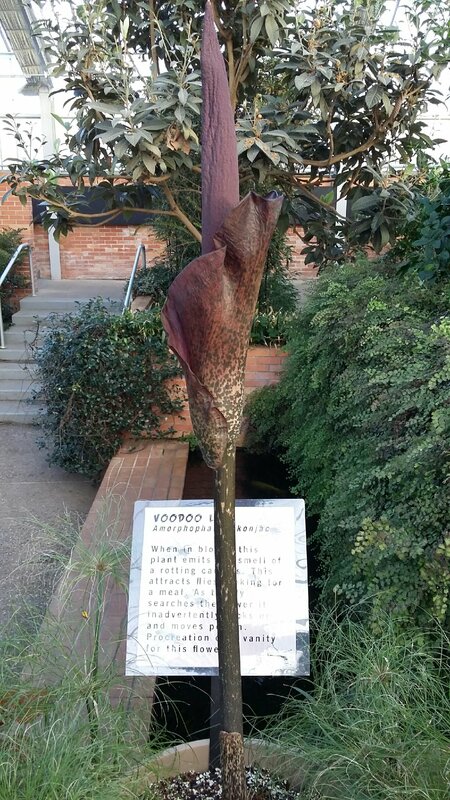 As if the weather isn’t a good enough reason to visit the conservatory at Matthaei, come out to see (and smell) the notorious voodoo lily!